Thanks to most people reading blogs on Google Reader and other platforms like that, many of us have gotten lazy. I will admit it, I read hundreds of posts and just do not click over to leave comment love to every one. Why? Well, the simple truth is that there is just not enough time in the day. Thanks to this, I try to hit the majority of the blogs that I read and leave comments a few times a week. In addition to this, I make sure to reply to all comments left on my blog via e-mail and visit their blogs. As a community, we need to show each other some comment love. On Thursday, I wrote Commenting on Comments after watching Telling Dad’s new song parody. It is a gem and really tells a story. We need to do more to let others know that we are reading. We all have busy lives, but taking a few minutes to let someone know at least once a week that you are out there reading and appreciating their work is nice. What is your general rule about commenting on other blogs? Do you have a system that you use? Please share because I think we can all learn from this and help others out with more comments all around. I *try* to comment on any post I read! I don’t get around to others blogs as much as I want too, my 5 kids kind of take any spare time I have so I feel awful about it! I am often up WAY before I need to be, like today, so I comment now. I comment during my lunch break, too. I am big on giving feedback and know that others appreciate comments. Happy Friday and here’s my Aloha! I do comment on about 100 blogs per day. Some I visit have these crazy log-ins and spam guards. I do not mind the spam guards but the sign-in drive me crazy. I like to make it easy for those to comment. Linking your blog to a facebook network allows folks to comment within that network. Although you do need to have them as friends. another thing is to get Google reader to somehow have a comment area. I do get a few e-mails from Goggle readers. 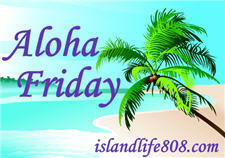 Here’s your link to my Aloha Friday Post. .-= Auntie E´s last blog ..Wordless Wednesday- Spring into Summer… =-. .-= Stacy (the Random Cool Chick)´s last blog ..Aloha Friday Follow – Bread Storage =-. I try to leave comments on as many posts as possible for memes like Aloha Friday, but if it’s just a post I’ve stumbled across on a blog i don’t usually read, I wouldn’t normally comment, unless something in the post appealed to me. .-= Rach´s last blog ..A;oha friday #138 =-. I attempt to comment everyone who is playing the same meme as I am. Friday-Follow can be a bit difficult. If I see questionable content, I move on. .-= Harriet´s last blog ..What’s your TV Vice? How about a Friday Hop or 2? or more… =-. I comment on blogs here and there when I feel I have something to add. Of course, I wish I had time to comment on more, but there just isn’t enough time in the day. .-= TechyDad´s last blog ..Aloha Friday: Kids’ Culinary Excuses =-. I wish I could comment on every post I read, but I have 107 blogs in my reader (many are discount and coupon related) and definitely not enough time to comment on all of them. I tend to pick the ones that really strike a cord, and those people who comment on mine. Also, if I’m part of meme, I try to comment on a good number of those. .-= Jolly Green Mommy´s last blog ..Aloha Friday #3? =-. but when some never comment back, i just start to skip them. .-= noelle d´s last blog ..Aloha Friday – =-. I return comments given to me and I comment on posts and blogs that I read and I can leave nice and caring comment. I do not believe on leaving comments when the post doesn’t do anything for me and I don’t believe in leaving negative comments. I don’t comment for the sake of commenting. .-= Bibi´s last blog ..Aloha Friday #8 & The Golden Girls =-. I definitely try to return comments because I love seeing them on my blog… but, I also try to leave something when I read other blogs. Never negative. In that case, I don’t comment. .-= Owen’s Mom´s last blog ..Giveaway Winners! =-. I have a small readership and this enables me to visit or return visits to all commentors. sometimes it’s hard to return all visits in the week, but I save them all and visit on the weekends and try to comment on more than one of their blog posts. .-= JamericanSpice´s last blog ..Collegiate Peaks – LA To AK – Aloha Friday =-. I leave comments daily on the blogs from my blogroll and also check another ones that are on my favorites. For me is very important leave comments. .-= Annie´s last blog ..Way Back When-esday =-. I try to leave comments on every post I read but sometimes I am too moved and can’t speak or I have nothing to add to comments already made. I do try to reciprocate comments left to me on my blog either by email or on the others’ blogs. I don’t really have a system though. I too am lost trying to find time and words to say. .-= Deborah´s last blog ..ALL CLEAR: FeedMedic Alert for Babasfarmlife =-. Starting to feel guilty, but I just don’t always have something to contribute. But, I’m working on cutting down the number of blogs that I read regularly so that I can make time to be a part of the blog communities that are left. Also, clearing my blog reader regularly makes it easier to notice updates as they come in. If it’s meme I comment or try to everytime..Most of the time I lurk & I am really bad at not commenting..
.-= Tatum´s last blog ..Aloha Friday June 11 =-. I make sure I comment back on every comment that is left on my blog besides the entries for the giveaways! I think that’s fair to do and should be done! I don’t have a routine down otherwise! I just try to comment whenever I can on others post. Have a great weekend! .-= Natalie A.´s last blog ..Friday is the Day to Follow Blogs! =-.